In line with previous reports, Tuesday brought forth the full and likely final trailer for Guardians of the Galaxy Vol. 2, James Gunn’s spacefaring sequel that asks Star-Lord and the gang to rally together and save the galaxy once more. Pegged for May 5th, excitement for the Marvel tentpole is naturally through the roof, and as speculation continues to swirl around the four corners of the Internet, Gunn took to Facebook (via CBR) late last night to tackle two points of contention head on: Adam Warlock and Darkhawk. Pointing to a new wave of Marvel Legends figures, fans stipulated that both heroes were set to feature in Guardians of the Galaxy Vol. 2. That’s simply not the case though, according to Gunn, who quashed any and all rumors revolving around Warlock and/or Darkhawk before they started to snowball. Though one might assume those aforementioned figures indicated Warlock and Darkhawk were bound for the big screen – not unlike the reveal of Giant-Man prior to the release of Captain America: Civil War – James Gunn made it explicitly clear that neither character has a part to play in the upcoming sequel. Heck, it even says so on the packaging. While there’s a small chance Gunn’s response is actually a red herring, we struggle to see a scenario in which Warlock and Darkhawk fit into the sequel’s stacked ensemble. 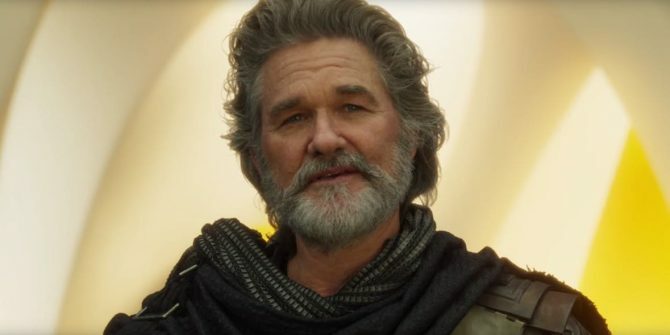 One character that is absolutely locked in for Guardians 2, though, is Kurt Russell’s Ego, the Living Planet. Seen below in human form (check out another pic of Russell’s character in costume here), turns out he’s the estranged father to Peter Quill, but don’t worry, knowing the identity of Papa Quill so far in advance won’t spoil your enjoyment of the end product. With a whole new compilation of fist-pumping power ballads in tow, Guardians of the Galaxy Vol. 2 is expected to slam into theaters on May 5th. Other Marvel blockbusters on course for a 2017 release include Spider-Man: Homecoming (July 7th) and Thor: Ragnarok, which will seemingly herald the God of Thunder’s most rib-tickling outing yet on November 3rd.